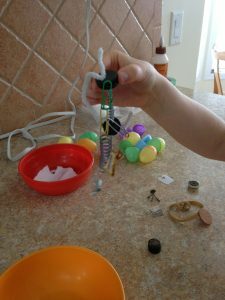 Plastic Easter eggs and some small bits from the junk drawer combined for Easter egg magnet science fun and it was quite an attraction for wee hands. Do you have a drawer in the kitchen to hold all the assorted bits and pieces that don’t go anywhere else? 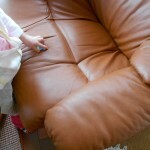 While often called the junk drawer, these things can be treasures for kids. 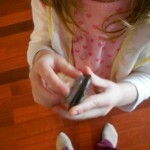 The kids looked thru the items and picked out some small metal, plastic, and wood ones. Then, Little Sister and Big Sister discussed which ones the magnet would pick up and which ones it wouldn’t. Most of the time, they agreed which ones they thought would be attracted to the magnet. 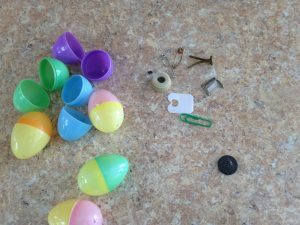 Then, one by one, each item was snapped into a plastic Easter egg. 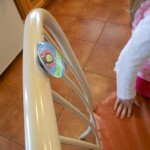 For each hidden object, the kids tried to pick up the Easter egg with the magnet. Some they could but no matter if it worked or not, we opened each egg to see what it was. 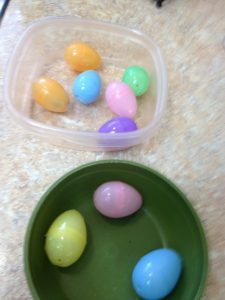 Some of the items were metal but hadn’t worked so the kids tried again without the egg. They were surprised that a metal tack and metal watch clip did not stick to the magnet but a pipe cleaner did. With the magnets and all the pieces, Little Sister wanted to make an ‘advention’ so she began sticking things to different places on the magnet. There were another couple of magnets and some of the objects twisted together. Creating a sort of free-form sculpture kept her busy playing and inventing. 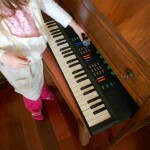 This was certainly child-directed play because she suggested it on her own and played as she wanted to. The Easter egg magnet science fun inspired her to try something different for herself. The magnets we used were from old shower curtains. Once the play was finished, all the bits went back in the junk drawer until needed for another play ‘advention’. That’s a good word because play often is an adventure and invention together, isn’t it? 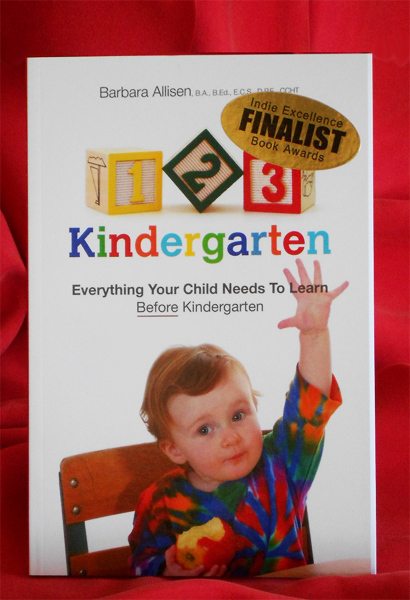 Parents do not need to be rocket scientists to involve kids in science play and learning. Kids can have some exciting science fun with magnets. 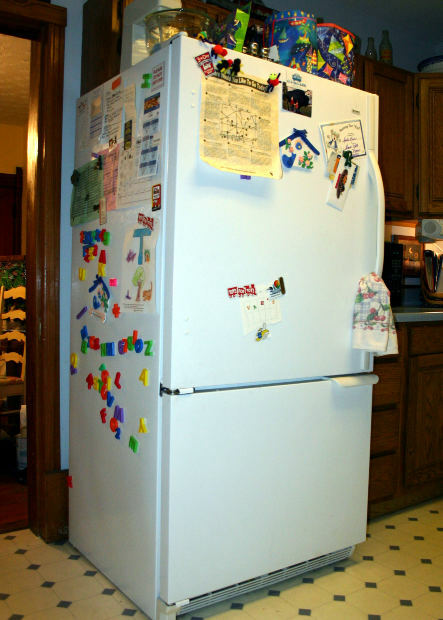 The most common magnets used to be fridge magnets, but with stainless steel appliances, kitchens haven ‘t got as many as they used to. Door latches on cabinets often have magnets and some toys. 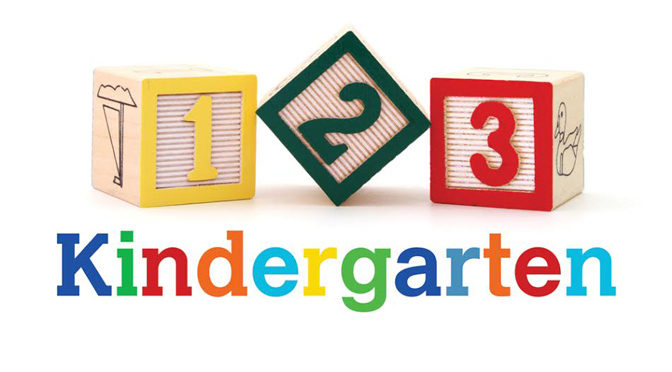 For some magnets to play with, toy stores have ones that follow safety standards for kids. Each year, some children are injured and treated for swallowing magnets so make sure any magnets are a safe size. Metal cookie sheets or large baking pans can substitute for fridge doors. A metal foot that popped out from underneath an easy chair was too intriguing to be ignored. Especially, when it turned out to be the same size and shape as a fridge magnet. Lo and behold, it stuck to the magnet, at least on the metal side. What else would it stick to? 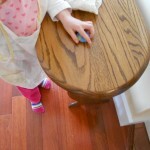 Little hands tried tables, chairs, the floor, a spoon, the dishwasher and even the rocks and trim of the fireplace. To extend, the activity, I asked if other fridge magnets also stuck to those things. And off went the eager, but young, scientist. 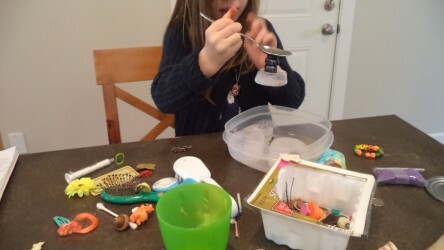 As Big Sister (6) and Little Sister (3) explored a bunch of little bits from the junk drawer, they quickly discovered that the magnets near the edge of the ice still worked. 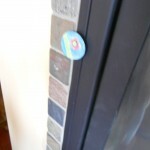 To make sure that any one item was attracted to the magnet, there was one magnet that wasn’t frozen in ice. We could check if the magnet would pick up the nails, screws, plastic spiders, and other assorted pieces. 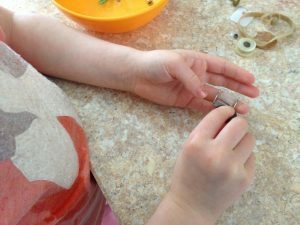 There are many other ideas for activities with magnets, such as trying to pull train cars with magnets using pipe cleaners, invisibly moving magnetic items on top of a thin piece of cardboard by moving a magnet underneath, putting pipe cleaners or bobby pins inside a plastic bottle and using a magnet outside to move them up and down, and more. 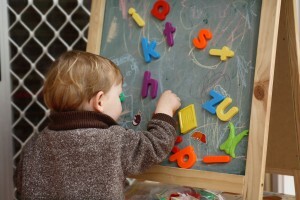 Children’s easels often have a magnetic side so kids can play with letters and other magnets. 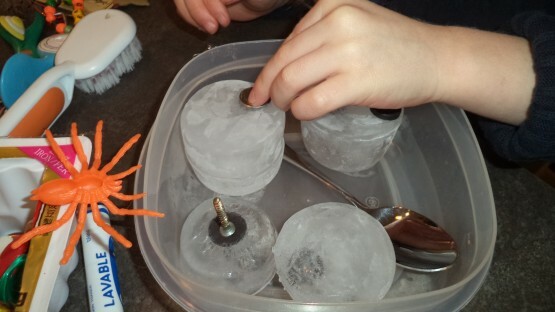 Kids will create their own experiments as they engage in science fun with magnets. 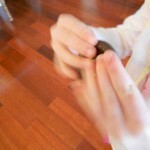 Has your child played with magnets? Valentines is about friendship and magnets really like certain metals. 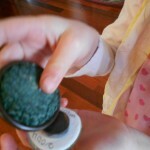 For valentines, how about a magnet and science play-of-the-day? Since February is still winter in many places, these magnets are frozen in ice. Will they still work? Does the ice make any difference? 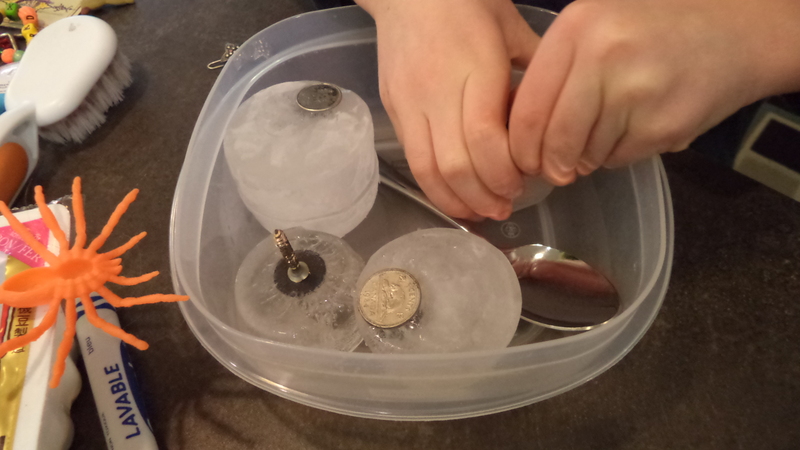 Before doing this, I froze magnets in containers just a little bigger than the size of ice cubes. Some of the magnets were right near the side or the middle at the bottom. By freezing a small layer first before filling up the container, I was able to get some magnets in the center. Big Sister discovered that the unfrozen magnet would pick up the other magnets even in the middle of the ice. She tried this over and over. Since sometimes the magnet wouldn’t work, I asked what might happen if she turned the ice block upside down or turned the magnet over. Little Sister liked touching the cold and see what would stick on the magnets near the top of the ice. 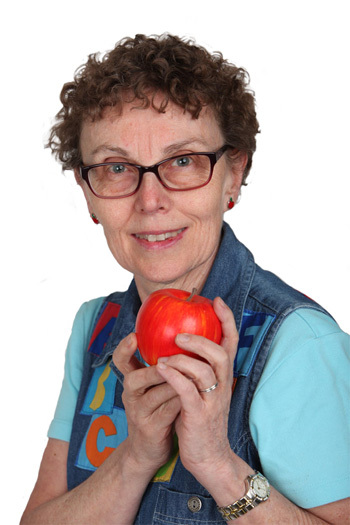 Science can happen for kids using everyday, ordinary items. 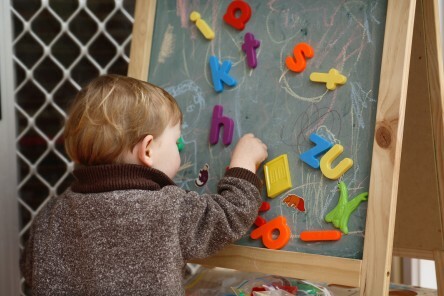 Kids don’t need expensive equipment or parents with science degrees. This science fun used ice, magnets, and miscellaneous objects from around the house and the toy box. It sounds like a contradiction but there’s plenty of room in science for creativity and imagination. Kids are great scientists because they wonder and ask questions. Does this play-of-the-day sound like fun for your little valentines?